The last day of June!! Kind of crazy, right? So, I thought I would do a new feature on my blog: a monthly wrap up. This will give me an opportunity to share some of my favorite things from the month, as well some my most recent blog designs. Fun! First up, my favorite things for June. It was kind of a slow month. I was sick for half the month. And...we moved at the end of May and are currently living with a family member until we find a new place. SO, most of my stuff is stored away for the next few weeks. Frustrating, yes...but also kind of great because I just grabbed a few things to use while we are here. While I've never been one who buys frivolously, there is nothing like packing up all your belongings to see where you have too many "extras". For example, I picked up the e.l.f. Skincare System (which came with the Daily Face Cleanser, Daily Hydration Moisturizer and Illuminating Eye Cream) in April. But, this is the skincare I brought with us, and I have to say...I'm really loving it. I also picked up the Nourishing Night Cream and REALLY love it. I have pretty good skin. I rarely break out, and though I am definitely starting to show some fine lines, they aren't too bad. (I blame the fat!...it fills you out!! HA). I have super dry/sensitive skin though, so that is something I am always concerned with. These are great because they are paraben/sulfate/phthalate free. LOVE that! Bonus? They are really really REALLY reasonably priced. YAY! I finally picked up the itCosmetics SuperHero Mascara. I had been wanting it for a while. And initially, I was very disappointed. But I usually hate all mascaras the first couple of uses...I think they are too wet or something. I almost returned this to Ulta, but I'm SO grateful I didn't. I LOVE it. Also loving the NYX Lip Butter (currently using Vanilla Cream Pie). I have really dry lips so I have a hard time pulling off lipstick, but this does a great job of adding color and moisture. Another previous favorite that I'm loving again is the St. Ives Skin Renewing lotion. It's also paraben free...which is something I try to look for in all my health/beauty products. It doesn't have a strong smell and it isn't sticky. And it's inexpensive! Ha. I got BURNT at the beginning of June. RIGHT before I got sick. SO the first few weeks of June had me feeling like a real winner. I was a mess. The upside? When all the red and peeling were gone (again, total mess), I had some color to my normally ghost white complexion. I don't typically wear a heavy foundation...but here lately, I'm just brushing on some Physician's Formula Mineral Wear powder foundation. Tan or no tan, I wear creamy natural. It's got a good SPF and stays on all day. In the entertainment department, C and I started watching Bloodline while I was sick. WE COULD NOT STOP!! It's so good. I don't know why we didn't watch until now. I'm not even playing when I say it stressed us both out and we often ended up yelling at the characters. But once we finished season 2 we were both like "now what?!". 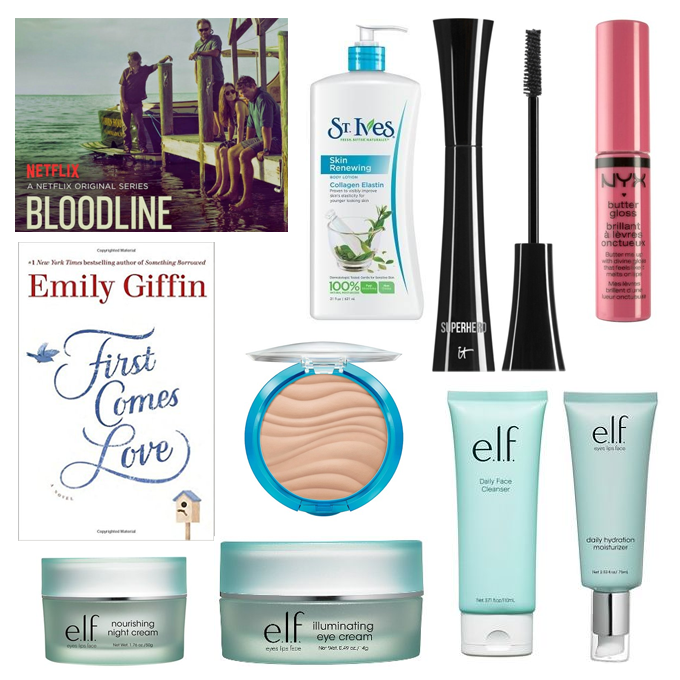 I also read Emily Giffin's new book, First Comes Love, and it was definitely my favorite read of the month!! The last few months before we moved were slow on the design front. But, after we got (semi) settled here, I was blessed with several new clients! I thought I'd share a few of my recent designs. 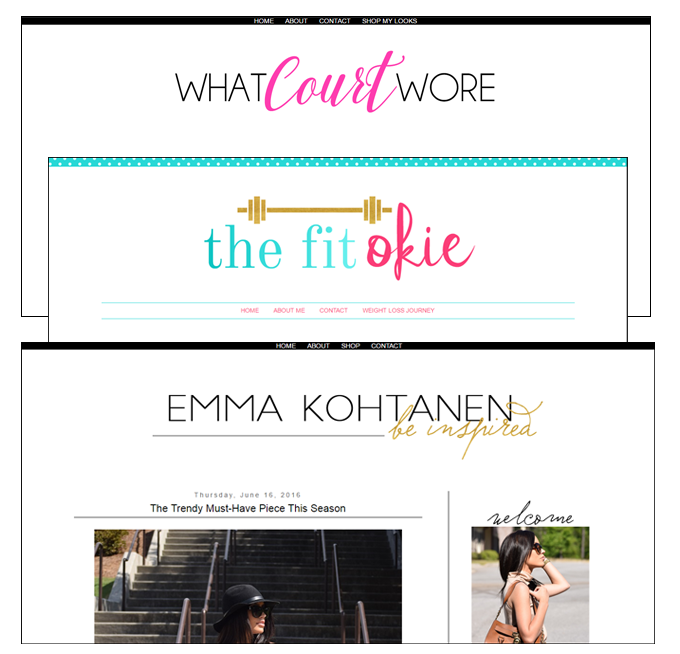 If you are looking for a new blog design (blogger hosted) email me!!! She hasn't launched her blog yet, but Courtney has a fabulous instagram account so I know her blog will be just as great. Keep an eye out for that! Mallarey has lost over 115 pounds! Um....AMAZING. Such a pleasure to work with her. How gorgeous is Emma? She is a Finnish-American fashion blogger. She has great style! The month started kind of crazy...but just got better and better. And we are making taco salads and watching Big Brother tonight...so it's ending fabulously! !